Internet has become more of a necessity than a luxury in today’s age. You don’t need to be connected to internet just for fun; you need it for much more than that. Being connected to Internet, you can do anything sitting from your home, be it ordering stuff online or manage your finances. However, to be able to use internet you also need a good browser. Chrome very well fits that description but at times you can face certain problems with Chrome too. One such problem that many people face is the DNS_PROBE_FINISHED_NXDOMAIN or DNS Probe Finshed NXDOMAIN error. So today, we’ll be taking you through a tutorial on how to fix this error. Open the Network and Sharing Center by right clicking on the Wi-Fi or LAN symbol in the notification tray in the bottom right corner of your desktop. Then click on the “Open Network and Sharing Center” option. 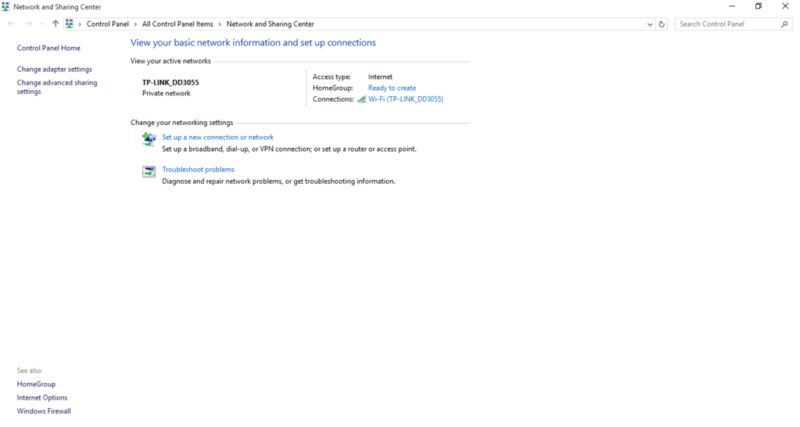 In the Network and Sharing Center, click on the “Change Adapter Settings” option in the top left corner. 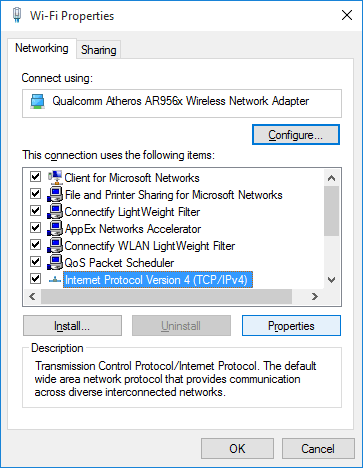 Select the active network connection and right-click it to open its “Properties” dialogue box. Select the “Internet Protocol Version 4 (TCP/IPV4)” and again click on “Properties”. 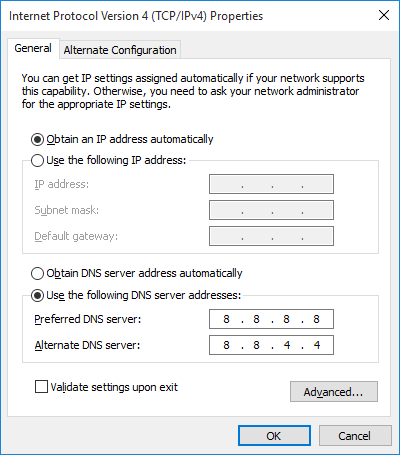 In the dialogue box that appears next, make sure to select the “Use the following DNS server addresses:” option. Fill in the following details: Preferred DNS Server: 8.8.8.8 Alternate DNS Server: 8.8.4.4. Also, make sure to check the “Validate settings upon exit” checkbox and then click on OK. The above-mentioned method works in most cases. However, in case it does not and you are still getting theDNS_PROBE_FINISHED_NXDOMAIN error, we have another method for you which involves Command Prompt. Open the command prompt window by holding down the Shift key and right-clicking on the Desktop to click on the “Open command window here” option. In the command window, enter the following commands one by one, each command followed by a press of the Enter button. After running these commands, restart your computer and the issue should be resolved. If you want to learn more about the above commands, read the description of each command below. If you are still getting the annoying DNS_PROBE_FINISHED_NXDOMAIN error, try this method which should solve the issue. 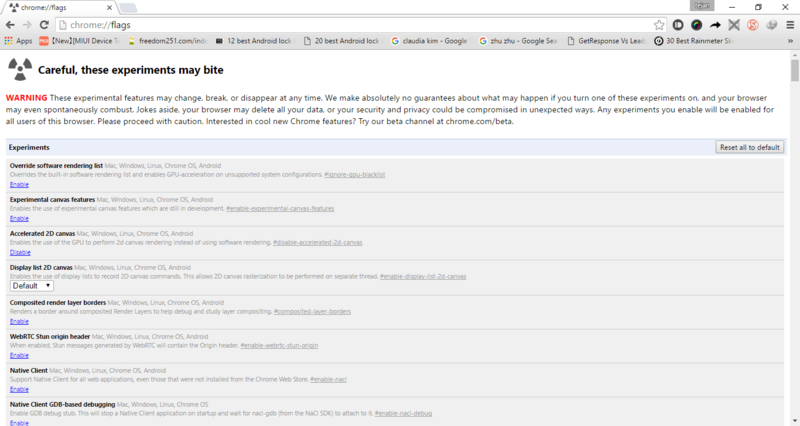 Launch Chrome and in the address bar, type chrome://flags/” followed by an enter. Next, click on the “Reset all to default” button. Then re-launch Chrome. The issue should be resolved. DNS_PROBE_FINISHED_NXDOMAIN error is one of the most common error that users get while using Chrome browser. So this was our article on how to fix DNS PROBE FINISHED NXDOMAIN error in Chrome. We hope the tutorial proved useful to you. Have any queries? Get back to us in the comments below and stay tuned for more Windows-related articles and tutorials.